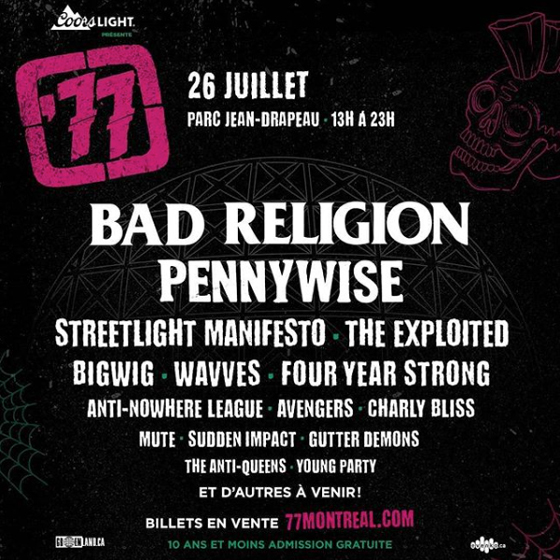 After bringing Rise Against, Suicidal Tendencies, L7 and more to Parc Jean-Drapeau last summer, organizers behind '77 Montreal have shared their initial 2019 lineup. Returning to the outdoor venue on July 26, the bill for the day-long fest is topped by Bad Religion and Pennywise, who are followed closely by Streetlight Manifesto, the Exploited, Bigwig, Wavves and Four Year Strong. Further acts set to appear include Anti-Nowhere League, Avengers, Charly Bliss, Mute, Sudden Impact, Gutter Demons, the Anti-Queens and Young Party. Further acts are set to be announced ahead of the event. Tickets for the fest go on sale tomorrow (February 1) at 10 a.m. local time, with further information here. As in years past, admission for children 10 and under is free of charge.